Following up Fin Punch, here's another Cartoon Hangover cartoon that I love to bits. 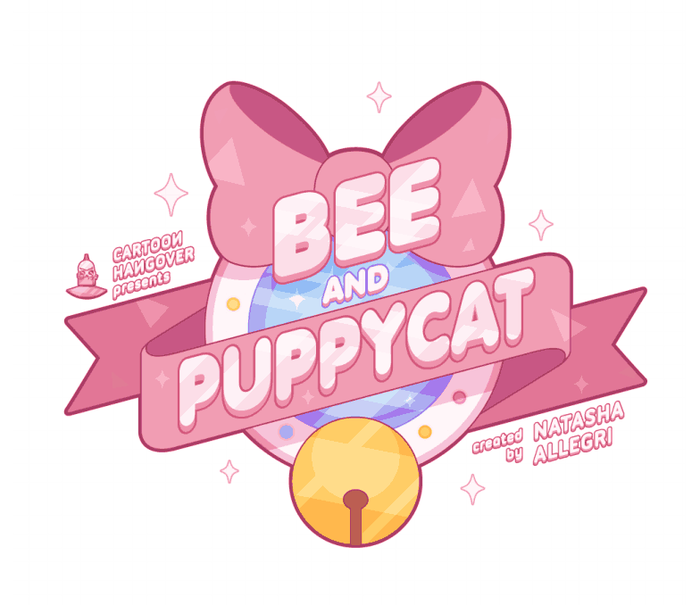 Bee and Puppycat is the story of Bee, an unemployed 20-something, trying to find her way in life. She has no real ambitions, no real job experience, and no real documentable skills outside maybe her ability to get fired. One day though, fate leads her to encounter a stray dog... or cat? Turns out Puppycat is a mysterious intergalactic entity, and him and Bee tackle intergalactic temp jobs together. There could be danger, or just strange alien experiences, and the temp jobs help them pay the rent. But the show QUICKLY became a successful Kickstarter that made over 30% of the original funding goal. 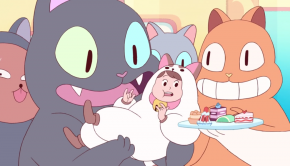 Bee and Puppycat "the Series" already has several episodes released on Cartoon Hangover with several more planned for later this year, following up the pilot while also adding more style and depth to the original concept. 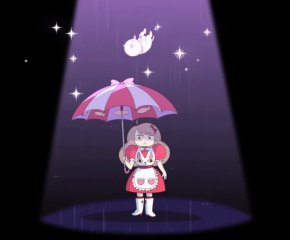 What makes Bee and Puppycat really special though is the show's target audience. Bee is 20 something, struggling with relationships and jobs and college, and she acts her age. Underneath the cutesy pink and pastel exterior, this show is filled with what could be considered pretty realistic examples of human interaction. Budgeting, learning to cook, being weird when you're by yourself, and all these other small things really make the world of Bee and Puppycat feel just like the day to day life of most people around Bee's age. There are no cheap laughs from popular culture, or making everything cute and innocent for children. For example, in the image above Bee is asked if she would like a pastry. Her response: "Oh, hell yeah!". And as with the image above, these realistic depictions of human interaction don't taper off just because weird stuff happens. These intergalactic temp jobs keep a sort of daydream quality to them, the strange and fantastic things happening being part of their own universe but still grounded in reality. It makes for a really interesting theme and for a really powerful story. Ah! I forgot to mention the story. 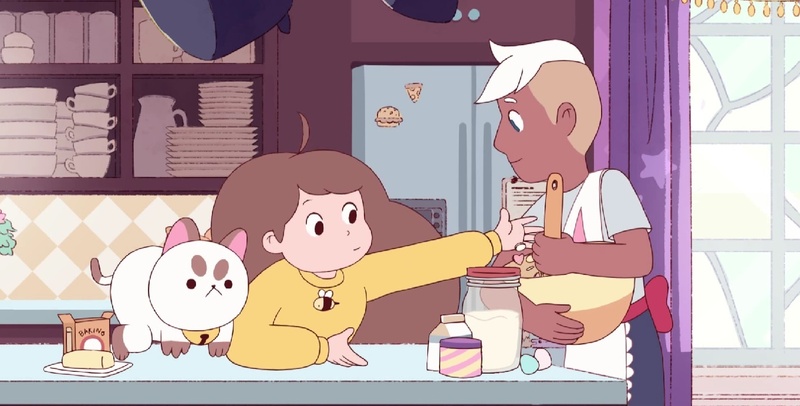 As with most cartoons I've brought up so far there are lots of secrets hidden inside of the show, and hopefully with the future episodes we will be hearing more about Puppycat's backstory. Maybe we will also learn more about the other recurring characters. Maybe we'll even see Bee learn how to actually cook a proper meal once. Bee and Puppycat is a very difficult concept to explain on paper. "We'll have this 20-something woman who meets and intergalactic puppy-cat hybrid and they go on weird temp jobs" doesn't really give the cartoon justice. The characters are flawed and realistic which make them extremely believable and easy to empathize with. Aside from the gorgeous art style, the show has a unique appeal which really gives it a lot of charm, and the fantastic adventures the characters go on really bring that charm to the surface.